MIFARE Premium Partner HID Global, an ASSA ABLOY company, has released a new contactless ISO combination card for secure RAIN RFID and HF applications. 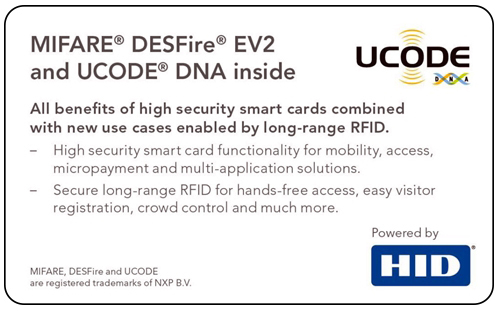 These cards based on NXP’s UCODE® DNA RAIN RFID chip support several use cases, such as hands-free or parking lot access, and come with a cutting-edge cryptographic security implementation. The cards are available as single-tech, and as a dual-frequency version using NXP’s highly secure and flexible MIFARE® DESFire® EV2 ICs. The latter addresses additional HF use cases like contactless payment schemes, loyalty programs and access control. For further information please download the dedicated datasheet or contact HID Global Identification Technologies (IDT).